test themselves on the mountain trails that gain and descend 15,000 vertical feet. exhausted runners and riders are just a few of the details she must consider. to ensure safe and successful passage of the runners and riders . 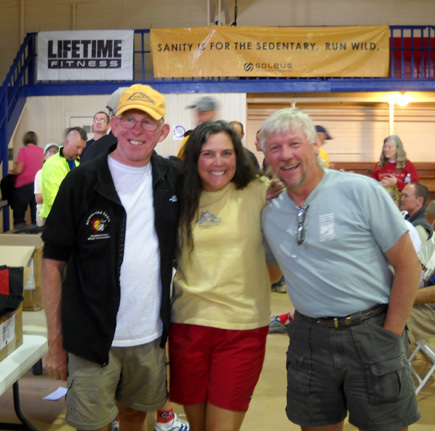 . ."
-- "Welcome to the Leadville Trail 100: The Race Across the Sky"
This is the eighth year that both Jim and I have done volunteer work before and/or during the Leadville 100 bike race and run. We miss helping with the races when we aren't here, like last year when high diesel prices kept us in Virginia instead of our beloved Rockies all summer. We're happy to be back this year so we can reunite with the large LT100 "family." I'm going to focus the beginning of this entry on our philosophy about the Leadville race and why we keep coming back. There's more to it than the challenge of the course and trying to finish the darn thing (between the two of us, we have only one finish in eight tries -- Jim has the finish, not me). Neither of us is even running the race this year, but here we are again. Why? Race management is well-funded; do they really need our help? Why would we work 40 hours or more for free? It's no surprise that the cost to enter many ultra running events is escalating. So is the cost of everything else. Some folks have a problem with either running or volunteering for large and/or expensive races. Most of them complain privately to family and friends (we've done that!). Others grouse publicly to the internet ultra list about high entry fees to some of the more popular events like the Leadville 100, Western States 100, Badwater 135, and JFK 50-miler, which now costs as much as some 100-milers. Well, guess what? Even some big-city marathons now cost more than some 100-mile trail races! I just read that the "courtesy early entry fee" for past LA Marathon entrants is $125. Don't forget to figure in the high cost to spend a couple of nights there . . . and I betcha they don't even have real food at the aid stations like your average ultra does. And from what I've read, ultra runs generally cost substantially less than adventure races, triathlons, and cycling events. In comparison, we usually get a lot for our ultra bucks. Since we retired Jim and I have also had concerns about the increasing costs of entry fees to some ultras. We don't have as much play money (discretionary income) as we did when we both worked. However, our thought process has evolved over the years to this rationale or "philosophy:"
Participating in ultras is a choice, not one of life's necessities. No one is forcing us to pay high race entry fees. Race directors can and should charge whatever the market will bear. They also get to make all the rules for their races! If we know or suspect that we won't get our money's worth from a particular race (or we don't like all the rules), we won't enter it. Same with any other good or service we purchase. We vote with our wallets. This is all very subjective, of course. Each person has to decide how to allocate his/her dollars for maximum personal benefit. YMMV. Interestingly, some races are worth more to us than the entry fee -- examples are the Hinson Lake 24-hour race in North Carolina (a measly $24) and Across the Years 72/48/24-hour runs in Arizona (reasonable cost with numerous amenities and a format we love). 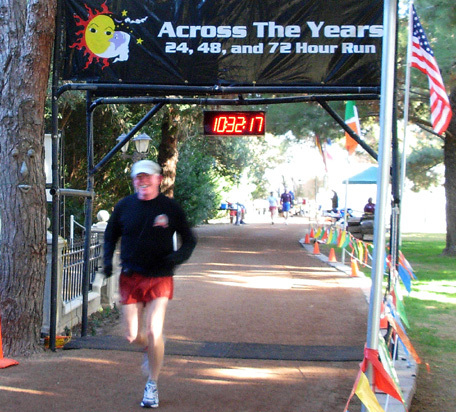 Jim has fun at the 2007 Across the Years 24-hour run. There are other races where we don't believe we have gotten enough value for our $$$ to go back again, or there are other costs (e.g., too long of a drive or no nearby camping) that we don't want to incur. I'm not going to name any of them because they may be favorites of other people. As retirees with more time on our hands than money to burn, we also have the option of volunteering at races we don't want to run (for whatever reason). That way we get to socialize with old friends, make new friends, and enjoy the ambiance of the race. It also makes us feel good to volunteer. It's a win-win-win for us, the runners, and race management. 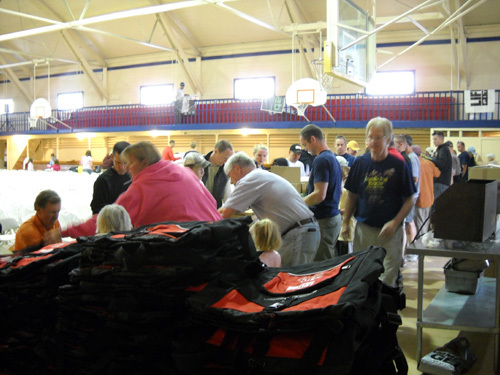 Volunteers form two long lines to stuff the LT100 bike race bags on Thursday. Let's put it this way: I don't remember any race director ever turning down our offers to help! 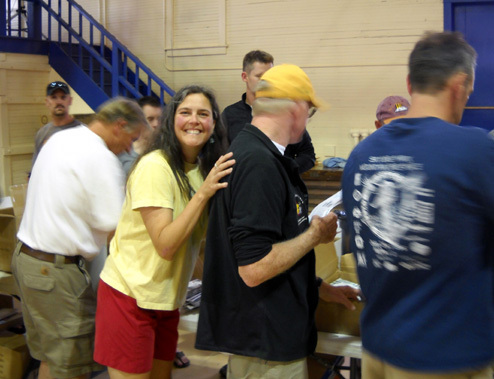 Now let's look more closely at the Leadville Trail 100 organization and I'll try to explain why we keep coming back here to run and volunteer. Clue: it fits into the philosophy I've outlined above. 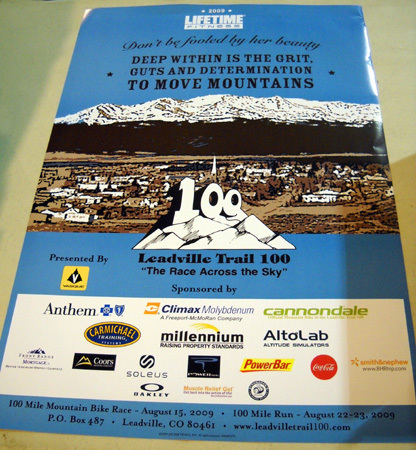 It's no secret that the Leadville Trail 100 is a business, not a non-profit organization. 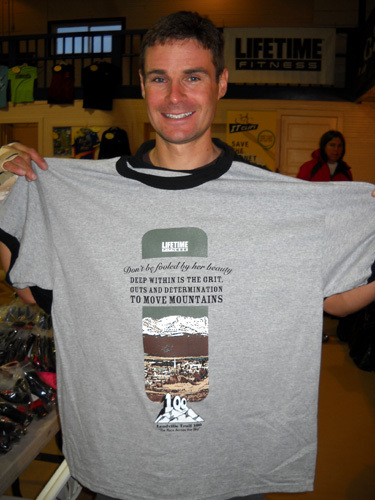 It has a non-profit component, the Leadville Legacy Foundation, which accepts donations and gives back some percentage of each season's profits to selected individuals and groups in the community. While a fair number of ultra race organizations are now for-profit businesses, I think most continue to be run by individual race directors or local running clubs who simply hope to break even after all the race expenses are paid. 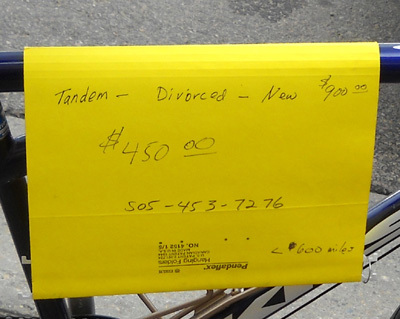 Leadville is at the high end of the entry fee scale for 100-mile runs unless you enter at least seven months before the race, when it's cheaper (this year's entry fees ranged from $225 to $300, depending on the entry date). It is well-managed, the aid stations are well-stocked, it has beautiful awards, there are plenty of course monitors, EMTs, and radio personnel to help make it safer -- but it's not designed to coddle the runners or riders in any way. It's rough and tumble, just like Leadville itself. 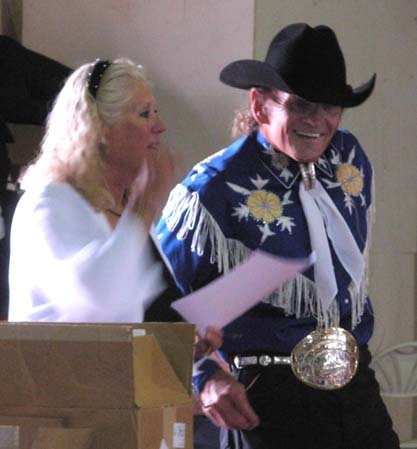 Merilee and Ken prepare to give out the 100-mile run awards in 2007. Ken is sporting his huge 10-year finish buckle. He earned that, too. Now I'm going to stir the pot a little. 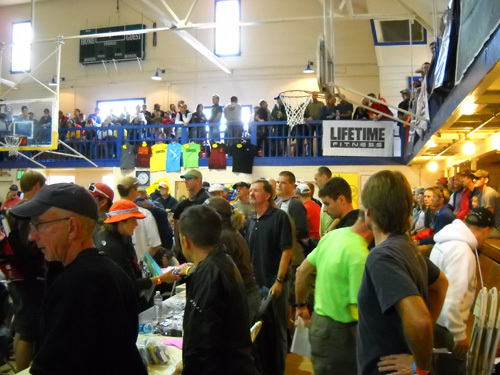 Think about the 1400+ men and women who made it through the LT100 bike lottery this year (entry has been through lotteries for several years because of the enormous popularity of this mountain bike race). Each paid $250 for a chance to ride in Saturday's race. Do the math and see how big your eyes can get! And that's just one of six or seven running and cycling events now put on by the LT100 management team. (The bike race is the biggest revenue source in the bunch). Are you drooling yet, dreaming of becoming a race director and getting rich quick?? I'm not on the inside of any profitable race organization but I can pretty well guarantee this is no get-rich-quick scheme. LT100 certainly wasn't. 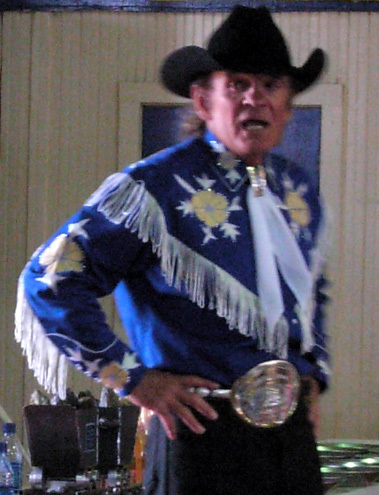 It took Ken Chlouber and Merilee Maupin (formerly O'Neal) over twenty years to get to the point where demand consistently exceeds supply in their 100-mile events. This year's race poster for the run and bike race; note the motivational slogan at the top. It's well-publicized by Ken and Merilee themselves that the LT100 run was created in the early 1980s to help keep Leadville solvent economically after its last remaining major employer, the Climax Molybdenum Mine, closed its doors and the town faced yet another bust in its cyclical mining "boom and bust" history. Over 3,000 people, half of the town's workforce, were out of work -- Ken included. I doubt that this race series has been the sole reason for Leadville's comeback, but when you consider the number of runners, crews, pacers, and volunteers that show up for especially the 100-mile events for several days to several weeks over the past 27 (run) and 16 years (bike), that's a lot of groceries and restaurant meals consumed, houses rented, motel rooms and campsites booked, and other goods and services purchased from local businesses. If you want a graphic description of Ken's mindset when he originally conceived the idea of the 100-mile run, read Christopher McDougall's recent book, Born to Run. While I think some of the characters in the book may be exaggerated, the portrayal of Ken sounds like pure Ken to me. He was hellbent on getting this race started, regardless of the dangers of running a hundred miles in the wilderness at high altitude. 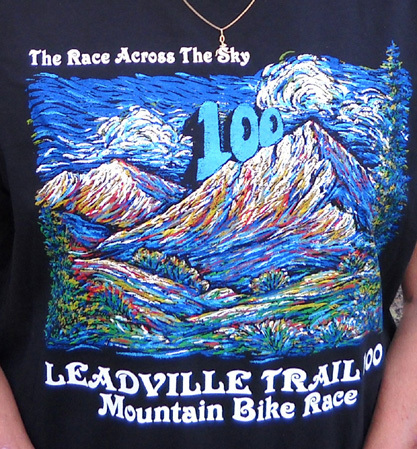 There is an article in this year's race booklet by Kathy Bedell that proclaims, "Trail 100 Strikes Gold for Leadville!" 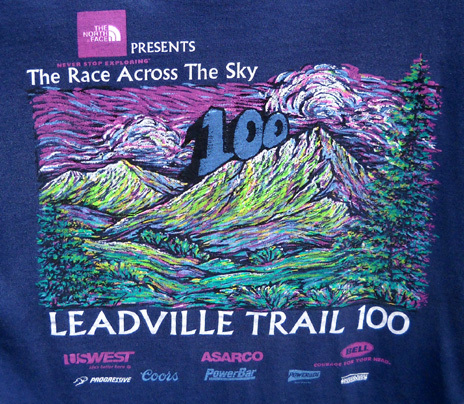 It describes the rise of the LT100 race series from its humble beginnings and its parallel to Leadville's silver and gold mining history in the 1800s. 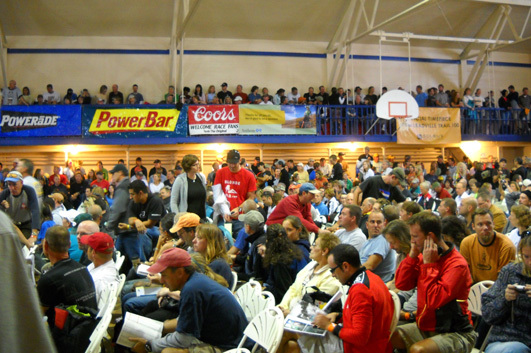 Ken and Merilee have been very successful in putting Leadville on the sports map. The races draw an international crowd. Both the 100-mile bike and foot races fill up so quickly they either have had, or continue to have, lotteries to keep the number of entrants at a safe level. Race management has a good thing going, and I can't blame them for milking their current popularity for all it's worth. The LT100 foot race began in 1983 with only 45 runners and grew until it reached about 600 entrants in the mid-2000s. The LT100 bike race began 16 years ago. It, too, grew by leaps and bounds until it had to be controlled by a lottery to keep the numbers at a safe and manageable level. In recent years it has been determined that the number can be increased to its present level of 1400-1500 entrants. It will be interesting to see if even more riders are allowed to enter next year. 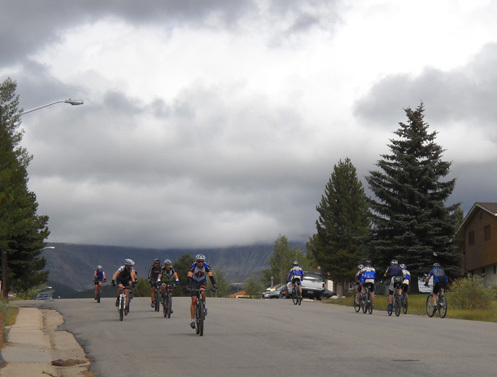 LT100 bike entrants work out the kinks on 6th Street late Friday afternoon. Other LT100 events include a three-day running camp in late June that allows folks to see about 60 miles of the run course (we enjoyed the camp we attended ten years ago), the marathon run and "Heavy Half Marathon" run (about 15 miles long) held in early July, the Silver Rush 50-mile mountain bike race and run in mid-July, and the LT100 10K run held the same weekend as the 100-mile bike race. The 10K run will be held at noon on Sunday, after the bike awards ceremony. If we get too lazy to go outside to watch the race, we can see the runners from our camper windows as they make the turn at 6th Street and McWethy. 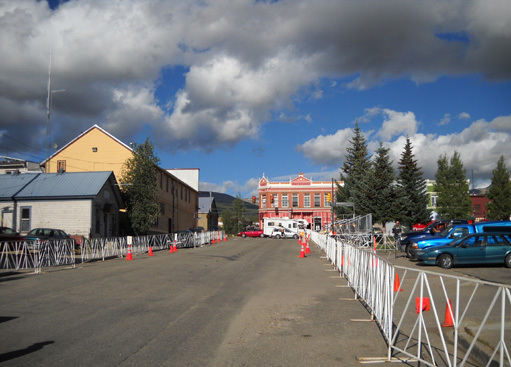 A new event called "24 Hours of Leadville" is planned for September 4, 2010 but there is minimal information about it now on the website and we keep forgetting to ask Merilee or Ken about it. I don't know if there are separate events for runners or cyclists, or if you have to do both. Depending on the format and course, we might be interested in that event next year. 14er Mt. 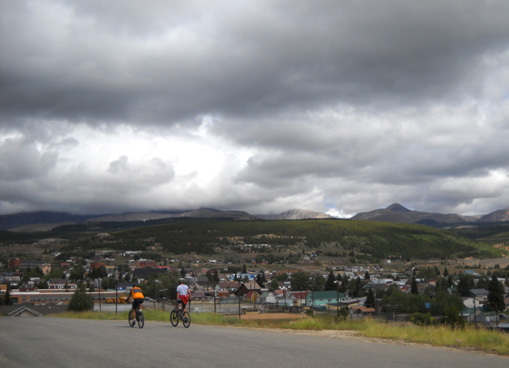 Sherman is shrouded to the east of town as two cyclists take one last ride on Friday afternoon. Back to the money issue . . . I have no problem with whatever profit Ken, Merilee, and the LT100 corporation earn. Yes, EARN. It's not like they stole the money from unsuspecting victims. I believe in capitalism, entrepreneurship, creativity, turning a good idea into reality, and hard work. My favorite book is Atlas Shrugged, remember? Folks who don't want to pay the fees LT100 charges aren't forced to pay them. There are plenty of low-cost and no-fee ultra events all over the country from which to choose, and they can be just as challenging and as much fun as the high-dollar races. Or, just come enjoy the LT100 events by being a pacer, spectator, or (better yet), a volunteer. 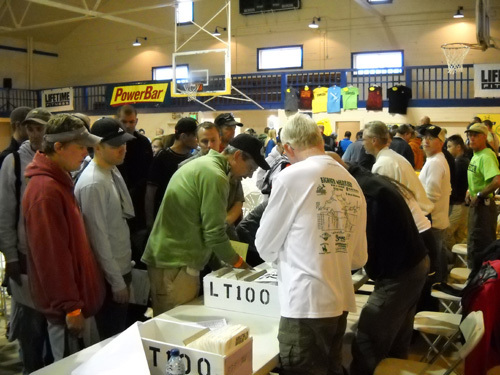 LT100 race management is backed up by a large cadre of volunteers who willingly give their time and expertise to make the race series successful. Why would anyone (like us) do this for free?? Because we don't feel taken advantage of, even though we've been known to joke about Merilee's new and expensive SUVs. If we felt "used," we wouldn't be here, or at least we wouldn't keep volunteering for or running the race. 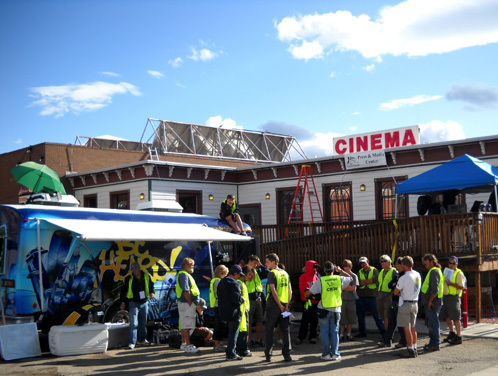 We'd just hang out, observe, crew, or pace someone. It's a lot of fun to see the runners, many of whom we know, for one or two weeks before the race as they acclimate to the altitude. We "run into" them out on the trails and in town, give each other big hugs, and continue conversations begun months or even years ago. It's more personal to volunteer when we know some or a lot of the race participants, as we do here. note the Soleus banner: "Sanity is for the sedentary. Run Wild." 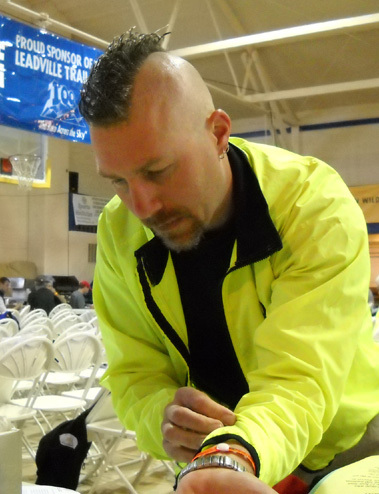 We feel good about "giving back" to the sport by volunteering our time; without adequate volunteer support, races would either die or not be able to offer as much to the runners (like course monitors, medical personnel, and radio communications for safety, or adequate staff for aid stations). Leadville is a cool (literally and figuratively) place to hang out in the summer, with lots of scenic trails to run and 14ers to climb. While we're here, we may as well help out. For their work, volunteers receive some other bennies besides the more esoteric ones listed above. We get what I consider to be nicer shirts than the run or bike participants (I've been wearing some of the LT100 volunteer shirts for ten years); we get supper (pizza, subs) after the packet-stuffing sessions for the bike and run; and we can eat free at the bike and run carbo-loading suppers pre-race. Volunteers at aid stations can also eat aid station food during the races. 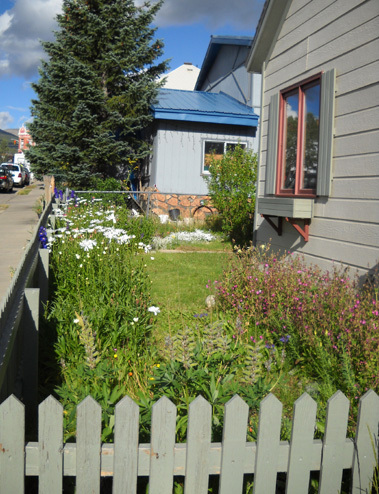 Over the years, many of the race participants and volunteers have fallen in love with Leadville to the extent that they not only keep coming back year after year like we do, some have also either purchased second homes here or relocated altogether (such as Don Adolph and Marge and Mike Hickman) to work or retire in or near the town. That's very similar to what has happened in Silverton because of the Hardrock race. These places get a hold on you! For now, Jim and I will just continue to camp out in both areas in the summer and do our best to keep both races alive. We've already got one house we seldom live in . . . 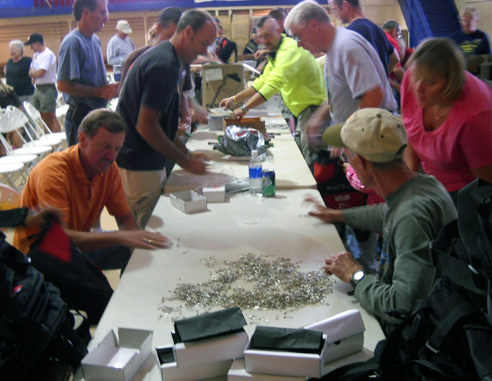 I'm not sure the LT100 has ever had just packets (large envelopes) for its 100-mile race participants but the process continues to be called "packet stuffing." Since we've been involved with the goodie bags at this race, it's had very nice canvas duffel bags that we fill assembly-line fashion with assorted items donated by sponsors, a detailed participant booklet, coupons for local businesses, and various necessities like pins for the race numbers. Since the bike race has so many riders this year (several hundred more than when we did this job two years ago), we figured it would take longer to stuff the bags than the hour it has usually taken in the past. This year the entire process took about twice as long (carrying in the boxes of items, arranging them on the tables, unwrapping all the bags, filling the bags in the assembly line, and putting as many bags as possible back in large boxes for distribution to the cyclists) -- but actually stuffing the bags did take just about an hour because there were so many riders and runners (about 40) handling the task. 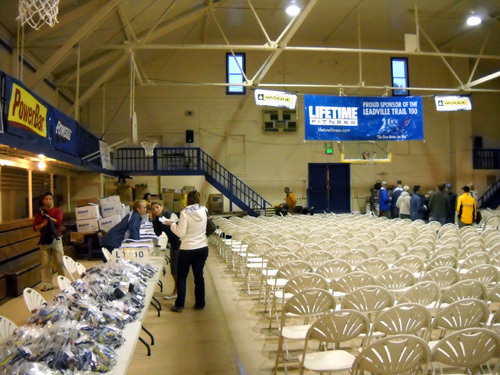 Jim and I arrived at the gym early to help fold the shirts the bike entrants would receive. 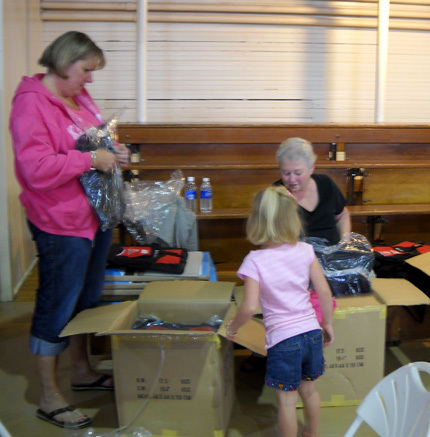 We got a nice surprise -- the shirts would just be handed out from the boxes this time, and not neatly folded. Great idea! That's a tedious task and quite unnecessary since most of the folks just quickly shoved them into their bags anyway. 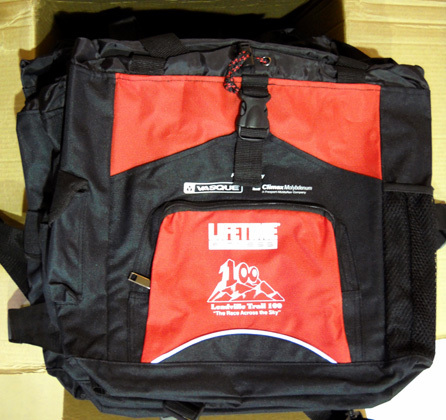 Years ago we used to make each bag specific to the rider or runner, with their race numbers and shirts already inside. 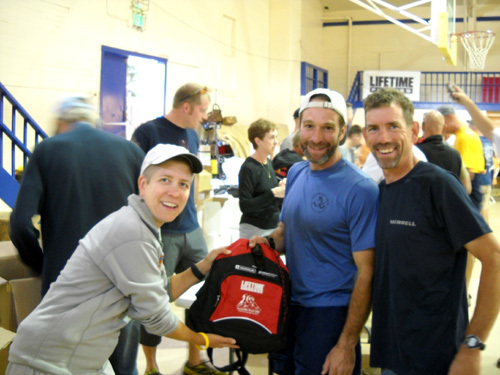 Jan and Bill Moyer, who run this operation for both 100-mile races, got very smart one year and decided to make the bags generic. That was positively revolutionary and greatly simplified the task of "packet" stuffing. Now race entrants get their bags, their numbers, and their correct shirt sizes from three different people during check-in. Not folding 1400+ shirts this year was almost as revolutionary. What a time-saver. the packet-stuffing assembly line is to the right, out of sight. Even so, the room would be filled to overflowing with all the cyclists and their crews during the race briefing, pre-race carbo-loading supper, and the awards ceremony. We noticed that the balcony was reopened now, which would help a little bit with the crowd. Another group of about ten guys was hanging all the sponsors' banners from the balcony railings. More folks were arranging all the items to go into the bags along 100 feet of tables, while others rolled posters and put rubber bands on them. Jim and I have done these jobs in previous years, too. I like them. I heard the runners will get the same type of bag this year. Unwrapping and stacking the empty bags was a job I could do either sitting or standing (i.e., not stretching or lifting too much for my cracked ribs and sore shoulders to handle) so I continued to do it until all fourteen gazillion of the bags were ready for stuffing. Even though we got a head start, we barely got done unwrapping all of them before the assembly line folks were done filling them! I had only a few minutes to wander down the line and take some pics of other volunteers before the bags were all filled and the line was closed down. Bill Heldenbrand was across the table, and other friends were nearby: Bill Dickey (white shirt in photo above), Karsten Solheim, John and Marcy Beard, etc. stuffed bags and put them in big boxes for cycling check-in the next morning. After enough bags were filled (about 10% fewer than the number of entrants, to account for no-shows) and arranged for pick-up by the cyclists the next morning, we all enjoyed a variety of pizzas and soft drinks that were brought to the gym for our consumption. See, what did I tell you about the perks of volunteering?? Because of the huge number of bike entrants this year, the check-in process started early to allow all the riders to get their bags, shirts, numbers, etc. before the 11 AM course briefing by Ken. Not everyone got checked in by 11, which meant Jan and Bill Moyer were still dealing with the process after the briefing. Jim and I don't usually get up till 7 AM or later, so setting the alarm for 5:15 was tough. 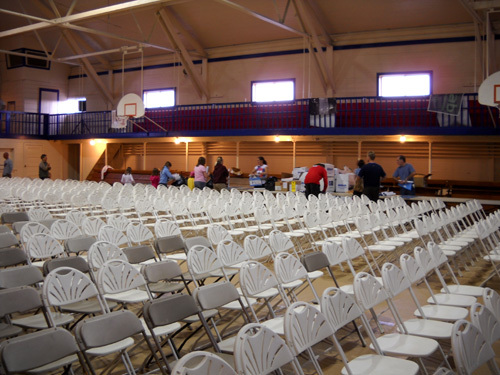 We got ready early and arrived at the gym about 6:15, fifteen minutes before the volunteers were asked to arrive. That way we were able to park close to the door and we got to choose the jobs we wanted. medical before getting their bags, shirts, numbers, timing chips, etc. at the tables to the left. We had several choices: checking everyone's ID at the door, working at the medical tables (just asking questions and putting the plastic wristbands on the riders, not doing weights or blood pressure like in the run), or handing out one of the following: bags, shirts, several pages of last-minute instructions, race numbers, computer timing chips, crew tags, or race posters. We've done all of these jobs before. This time we both chose to give out race numbers, thinking that would be fairly easy because we could sit down and not have to bend and stretch a lot. and tell each rider where to put each of the four numbers they received (helmet, jersey, bike tube, front of bike), plus some other verbal information. That made sitting difficult. So did the noise in the gym; we had to stand up for the riders to hear our spiel. We both ended up nearly hoarse after talking to so many people for four hours. We quickly learned to explain the numbers to small groups of people in our respective lines at one time, instead of each one individually. We still ended up hoarse! A rider (R) checks his cell phone for an emergency number while Dan-the-volunteer patiently waits. That was funny! I don't remember that happening nearly as often when I did this job two or three years ago. It says a lot about how much some folks have come to depend on the lists of numbers they have stored in their cell phones. It's hard to believe, however, that they wouldn't have their #1 emergency contact number memorized. Although neither Jim nor I received any direct thanks from the riders checking in (that's typical in our experience, unlike the ultra runners who often thank us for helping out), Bill and Jan told us later they'd received some good reviews this year about the smooth check-in process. That's good to hear; second-hand kudos are better than nothing. We don't volunteer for the accolades but it's nice to know that we're appreciated. Jim and I always thank as many volunteers as possible at the races we run. That's just common courtesy and spreads good vibes. Truth be told, if there was no 100-mile run a week later, we wouldn't come out here to work only the bike race. Very few cyclists are around a week later to help with the run. I think the main reason so many runners help with the bike race is because they're here early to acclimate to the altitude. Time to go -- they're crowding in behind us now. The gym became so crowded (above) by the time of the briefing -- and we were so exhausted from our job -- that we didn't stay to hear Ken's motivational speech and directions. He's a good speaker but we've heard his spiel many times now. We'll probably attend the runners' briefing next week because we'll get to see lots of people we know. And it won't hurt us to hear Ken's motivational speech again. It'll help get Jim psyched up for The Bear. Another perk extended to volunteers is the free spaghetti dinner before both races. Jim and I know to enter through the back door and not stand in line with hundreds of race entrants and their crews at the front door. Otherwise, we probably wouldn't eat there. 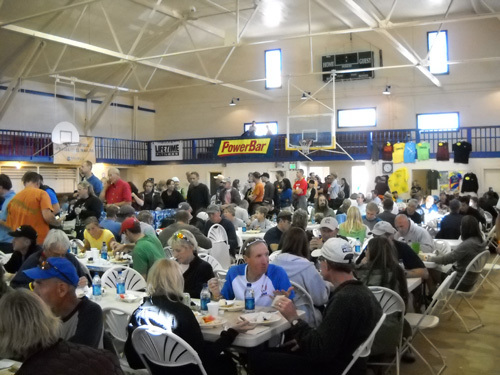 Cyclists and crews enjoy their carbo-loading dinner in the gym on Friday evening. After we got done with check-in on Friday morning, Jim took Cody for a long run on one of his favorite parts of the LT100 run course: out and back on the rolling Colorado Trail section between the Mt. Elbert trailhead and the town of Twin Lakes. He wasn't sure if he'd get back in time to go to the spaghetti supper so he encouraged me to walk into town and do it. and find a girlfriend / boyfriend who likes to ride?? and a second time to eat at the gym. I always enjoy the salad, rolls, raw veggies, fruit, meatballs or meatless spaghetti, and array of desserts and the chance to talk with other volunteers. I was a little disappointed that only the Moyers and three medical volunteers were there, but we had a good time. Now try to visualize 1300+ bikes and riders lined up on Harrison Ave. (to the left of the camper in the intersection in the background of that photo) tomorrow morning at 6:30 AM . . . I was already back home (about a mile walk) when Jim and Cody returned around 6 PM from their run. Jim drove into town to see if they were still serving dinner at the gym but decided before he got there to buy a burger at Wild Bill's instead. We'll both enjoy the free carbo dinner for the run next week because we'll be handling runner check-in at the same time. That check-in procedure is a bit different from the bike race. I'm still wearing my long-sleeved bike and run volunteer shirts with the original design from ten years ago. The volunteer shirt from the run is navy (below); the bike volunteer shirt has the same design on white. Each year, the volunteer shirt design is the same for both races but a different t-shirt color is used for each race. I'm curious to see what color our volunteer shirts for the run will be. Those are nice, too, but I like my volunteer shirt better! 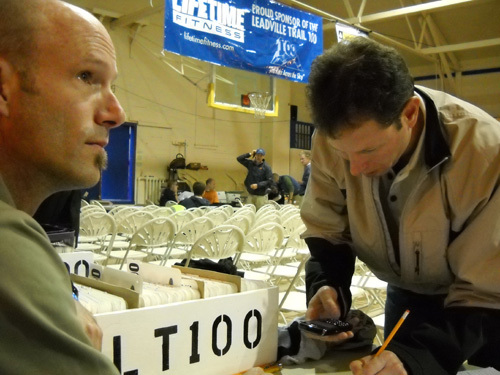 Next entry: the LT100 bike race -- will Dave Wiens be able to hold off Lance Armstrong for the second year in a row?? We'll have a good vantage point at 43 and 57 miles into the race.